NordVPN Review & Test for 2019 - Are the Rumors True? I started using NordVPN extension on Chrome, because I needed an easy way to avoid possible password leaks. 4 stars, because I just started using it, but I hope in the future it will work the same as now. I did lots of research for the not juste best vpn, but the best for streaming (especially for Netflix), and the winner was Nordvpn. What I appreciate the most, it has dedicated torrenting servers and sure, their no logs policy makes me even happier. What is your opinion on NordVPN? It’s incredibly easy to download, install, and configure NordVPN. After you buy a plan and create an account, simply click "Download". This begins the quick installation process. Once the app opens, all you need to do is hit "Quick Connect" or select a server to secure your connection. You'll be protected within a matter of minutes. The intuitive interface is consistent across all supported platforms. Beginners will find it easy to use, while advanced users can access and configure their settings with minimal effort. We weren't crazy about the map interface with location pins. Europe is very crowded and difficult to navigate. NordVPN offers a range of all-inclusive subscriptions. As well as the three plans listed above, they also recently introduced a 2-year plan, too. Prices change according to the length of your subscription, but you get the same features with every plan. NordVPN also offers great discounts on its one-year and longer plans. The three-year option is the cheapest in the long run. At less than $3/month for a long-term plan, NordVPN is among the most affordable options we tested. NordVPN accepts a variety of payment methods. These include popular credit cards (Visa, MasterCard, American Express, Discover) and other platforms like Alipay, GiroPay, SOFORT, iDeal. You can also purchase NordVPN anonymously with Bitcoin and other cryptocurrencies. IMPORTANT: You can't buy NordVPN with PayPal. NordVPN offers a 30-day money-back guarantee. When we tested the company's refund policy, we received our refund hassle-free within a couple of days. Customer support is one of the main areas where NordVPN really outshines the competition. Chances are you will never need to contact their team, but if you do, you can count on a prompt, friendly reply. 24-hour live chat - this is perfect for instant support and getting a quick answer to any VPN-related question. Email support - when we tested NordVPN's customer service, we received a reply within 24 hours. Help Center and FAQs - NordVPN's knowledge base includes frequently asked questions, tutorials, and categories filled with useful general information. NordVPN's site is available in 20 different languages. However, it's worth noting that their "Help" section is only available in English. But good marketing isn’t always reserved for good services. So we put NordVPN to the test, to see if it can back up its words with real facts and to see if the rumors were true. At first glance, this Panama-based VPN seems to cover all the bases. It boasts a massive network of 5,400+ servers in 61 countries, with special categories for streaming, torrenting, and extra security. Protection is on point as well, thanks to strong 256-bit encryption and a combination of highly secure VPN protocols (OpenVPN and IKEv2/IPSec). All wrapped up in intuitive apps that look and feel good. We’re off to a great start here, but there’s much more to talk about. In this review, we’ll look at all the important details that either make or break a VPN. Stick around to find out whether NordVPN lives up to its reputation, or if it’s just another case of style over substance. NordVPN - Are the Rumors True? If you subscribed to NordVPN via PayPal in the past, you might have noticed something odd. Instead of Tefincom & Co S.A. – the Panamanian company behind NordVPN – the selling merchant was listed as CloudVPN, Inc.
CloudVPN is a registered US company. Why was NordVPN using an American company for PayPal transactions, and why does it still do so for its Android version? More importantly, does this affect user privacy in any way? After all, Panama is a privacy haven. The US? Not so much. As it turns out, CloudVPN is simply a payment collector for NordVPN, and is in no way affiliated with the service outside of that. Thanks, Mark! We went on to learn that payments directed to Panama are often flagged as suspicious. The same applies to Panamanian apps that seek approval on the Google Play Store. As it turns out, partnering with another company to handle payments is common for VPN providers in exotic locations, and necessary for the VPN itself to be distributed without issues. So, is this acceptable or a red flag? Here’s what we got out of all this. As far as the user is concerned, NordVPN is based in Panama – it’s subject only to this country’s jurisdiction, and no other’s. The partnership with CloudVPN is strictly related to app registration, and has no effect on the VPN’s legal situation. In short, don’t worry! NordVPN is safe to use and honest about its Panamanian headquarters. Streaming – Does NordVPN Work with Netflix? The notorious Netflix proxy error stops many VPNs from accessing the popular streaming service. Fortunately, NordVPN isn’t on this list. In fact, it’s one of the best VPNs for bypassing Netflix’s strict new detection measures. In our tests, NordVPN worked flawlessly with Netflix catalogs in the US, UK, Canada, France, Japan, and Brazil. This is a huge advantage over many other VPN services, which are usually able to access just one or two regional Netflix versions – and often with hiccups along the way. NordVPN proves itself to be an excellent choice for streaming thanks to its proprietary SmartPlay DNS feature. In short, SmartPlay is integrated into all NordVPN servers, and helps you greatly with getting past geographical restrictions. It springs into action automatically, so you don’t need to set up any advanced settings – just connecting to a server is enough. NordVPN also makes the extra effort to provide additional info on how to stream your favorite content without a hassle. In the FAQ section, you’ll find instructions and server suggestions for Netflix and other popular streams like Hulu, BBC, and Amazon Prime Video. We didn’t need any extra assistance, as the VPN worked effortlessly in all our tests. Still, it’s great to see NordVPN standing behind its product with readily available help. We’ll cover NordVPN’s overall support shortly. But first, let’s talk about speeds. Speed Test – How Fast is NordVPN? All of the unblocking power in the world won’t mean anything if your VPN is sluggish and unstable. This is why it’s important to know what speeds you can expect from your service. A decrease of 3.73% in download and 5.56% in upload is barely noticeable. We were very close to our original speeds, which is a great result. This was a big drop, amounting to a 75.35% and 86.27% decrease in download and upload, respectively. Since our tests were based out of Europe, we were prepared for such a result – but in the end, we weren’t satisfied. As you can see, these results are much more impressive. We picked a server with a slightly higher load (around 40%), but it paid off with great speeds and lower ping. A decrease in download of 9.46% meant we were well within “blazing-fast” territory, and our upload speeds even increased slightly! This is what we like to see. Not bad at all, considering our test location is very far away. Upload suffered a major hit, as expected, but the overall speeds were still enough for hassle-free streaming and other bandwidth-heavy activities. Every VPN will slow you down in some way. So will NordVPN – but not by much. Our tests revealed a reliable service offering fast and stable servers. Even if you aren’t a fan of quick connect features, it’s easy to find a suitable high-speed location. If you want to go fast, NordVPN will happily deliver some great speeds. NordVPN has dedicated P2P servers. You can access them easily from the side tab in the app. There are more than 4,600 servers in 46 countries specifically tailored for torrents. The good news for torrenting fans doesn’t stop here. NordVPN also provides SOCKS5 proxies – you can easily set up your torrent client with one and enjoy even faster speeds. While a SOCKS5 proxy isn’t fully encrypted, it still provides security via extra authentication, which is considered enough for secure and private torrenting. Overall, NordVPN offers exceptional P2P support and a variety of features for smooth, safe torrenting. This, coupled with the great speeds, makes it one of the best VPNs for torrents we’ve reviewed. Security – Is NordVPN Safe? So far, NordVPN has defended its reputation as a solid choice for streaming and torrents. But private and secure browsing has always been this VPN’s forté. In fact, NordVPN underwent an external audit from a Big Four accounting firm recently, and it confirmed VPN’s claims of privacy and security. We aren’t allowed to share the full report here, but NordVPN subscribers can access it from the Member Area on the website. We take a closer look at NordVPN’s overall security below. No. NordVPN is officially registered in Panama – hardly the Silicon Valley, but a country with many other benefits. For one, Panama is far away from the Fourteen Eyes surveillance. This is very important for privacy, as a VPN based in a Fourteen Eyes country is within reach of a massive spy network that’s known to gather and share all kinds of sensitive user data. This isn’t the case with NordVPN – a strong start. Moving on, Panama doesn’t have any invasive data retention laws. Normally, such legislation would require internet and VPN service providers to keep logs of their users’ online activity for set periods of time. NordVPN doesn’t have to comply with any of that, which makes it one of the few VPNs with a true zero-logs policy. That said, keep in mind that NordVPN will keep a record of your email address and payment data if you choose to buy a subscription the traditional way. This is common for every VPN service. You can avoid sharing too much by using a separate email and buying with cryptocurrency, which NordVPN offers as a payment method. Does NordVPN Have an Adblocker? NordVPN claims to provide adblocking and extra malware protection with its very own CyberSec suite. It’s built-in and takes just one click to enable – but does it work? Absolutely. Over a two-hour test period, we didn’t encounter a single annoying pop-up and enjoyed a fully ad-free experience. We were even able to skip YouTube ads entirely! CyberSec is a great addition, but it’s just one of NordVPN’s extensive security features. Remember the specialty servers we mentioned earlier? Aside from streaming and torrenting, these help with advanced protection as well. Double VPN servers do exactly as the name suggests. By routing your data through two VPN servers at once, you benefit from double data encryption. While most users won’t need this for their torrenting or Netflix sessions, it will be appreciated by those looking for an extra layer of protection. Let’s talk about the kill switch – an essential part of any solid VPN’s arsenal. Here, you get not one, but two of them. Thanks to the extra obfuscation and bulletproof encryption (more on that soon), NordVPN is one of the best services you can bring with you to China. It takes a lot for a VPN to bypass the Great Firewall, and even top-shelf providers can struggle in achieving this task. However, NordVPN has proven itself as a reliable pick for China many times – just remember to install the VPN before you’re in the country, or you may have trouble accessing the website and downloading the software. NordVPN’s obfuscated servers also work in other difficult regions like Iran, Qatar, and the UAE. It’s possible you run into issues – no VPN is 100% effective in such matters, after all. That said, you’ll be hard-pressed to find a more dependable service for stealth. Price and Value for Money – Is NordVPN Worth It? NordVPN is an impressive multi-purpose VPN. It thoroughly covers all aspects of a premium service, but that must mean it’s also expensive. Right? Wrong! Compared to other top-rated VPN providers, NordVPN’s monthly subscription is the same – a little too pricey. However, it really pulls ahead with yearly plans and more, thanks to regular huge discounts. For the amazing value it offers, NordVPN is actually priced very reasonably. Even users on a budget can easily afford it. Without a doubt, NordVPN currently offers the best value on the market – especially if you’re hunting for a long-term service. What’s more, you have great opportunities to test this VPN in all its glory – for free! Does NordVPN Have a Free Version? Although NordVPN doesn’t maintain a fully free version, it comes with a free 7-day trial. This is even better, and we’ll tell you why. Free VPNs have the obvious advantage of costing nothing, but you’ll often trade money for a different “currency” in the long run. Whether it’s poor performance, limited bandwidth, or – worst of all – your privacy, you’ll always pay for something in the end. A secure VPN needs money to maintain its infrastructure and provide an outstanding service, period. With NordVPN, you get a whole week to see what it’s all about. The best part is you’ll have access to all servers and features – a huge advantage over many other VPN services. Seven days without any restrictions sounds too good to be true, but NordVPN is confident enough to offer a full test drive with no strings attached. Sure, you’ll need to “subscribe,” but you can also cancel at any point during the trial period. This is what we want to see out of all premium VPN providers. Great job, NordVPN! Once you’ve seen the free one-week trial, you might expect NordVPN to cheap out on the refunds. NordVPN does state that a troubleshooting attempt will be made, but if you aren’t satisfied with the outcome, you’ll be sure to get a refund after you cancel your account. Don’t worry – we’ve already tested it. Keep in mind that the 30-day money-back guarantee does not extend to purchases made directly via Apple’s App Store or authorized resellers. In such cases, you’ll need to contact the respective store and ask for a refund there. Is NordVPN Compatible with My Device? If you’re running one of the major platforms/browsers on your device, you’ll be able to enjoy one of NordVPN’s excellent apps. Currently, they’re available on Windows, macOS, Linux, Android, iOS, and Android TV. Browser extensions for Chrome and Firefox are also included, but keep in mind those are proxies and not full-fledged VPNs. That’s not all – advanced users also get plenty of options for manual configurations. From Windows XP and BlackBerry devices to numerous router firmwares, Raspberry Pi, and even pfSense, that’s quite the collection. 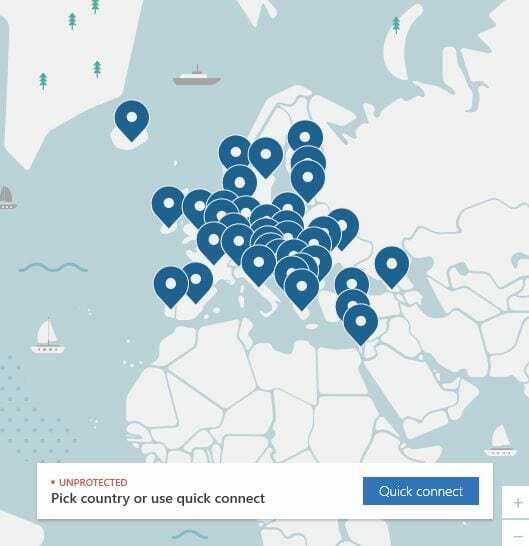 NordVPN also allows six simultaneous connections, which is enough for small businesses, device freaks, or the whole family. Strong encryption is another aspect that separates a great VPN from the average ones. And NordVPN is firmly in the “great” category. You’ll enjoy bulletproof AES-256-CBC encryption with the OpenVPN protocol – one of the strongest combinations available. Users on Mac and iOS get AES-256-CGM encryption with IKEv2/IPSec, which also offers exceptional security. NordVPN also implements Perfect Forward Secrecy, meaning unique session keys for even better privacy and stronger encryption. This is achieved with 2048-bit Diffie-Hellman keys for OpenVPN, and 3072-bit Diffie-Hellman keys for IKEv2/IPSec. As for other VPN protocols, NordVPN has recently stopped supporting dated alternatives like PPTP, SSTP, and L2TP/IPSec. Honestly, OpenVPN and IKev2/IPSec are all you’ll ever need, but more variety is always welcome. Overall, NordVPN’s encryption is best described in one word – flawless. The quality of customer support is an accurate way to determine if a VPN provider truly values you as a customer. We didn’t expect a detailed answer from a quick chat, so what we got was more than acceptable. More importantly, Jack was quick, friendly, and informative – definitely deserving of a thumbs up. For more technical questions, we recommend sending NordVPN an email. Response times are fast, and you’re likely to get better, in-depth information that way. In the end, we left the chat satisfied. NordVPN truly offers 24/7 support in real time, and it’s one of the best out there. So far, we’ve covered everything you need to know about NordVPN, except one thing – how it feels in a hands-on test. We had no issues with NordVPN’s clean and user-friendly interface. Switching servers and browsing the specialty tabs was smooth and easy – great news for beginners. The results didn’t disappoint. NordVPN isn’t just easy to use, but leak-proof as well. Overall, NordVPN offers a wonderful user experience. It doesn’t matter if you’re new to VPNs or a seasoned veteran – you’ll find all you need with ease. Do we recommend NordVPN? Absolutely. It’s our top-rated VPN for a reason. Several reasons, in fact. It provides superb encryption and the right protocols. It has a legitimate zero-logs policy, confirmed by an external audit. It’s the perfect choice for streaming Netflix (and much more) without restrictions. It supports torrenting and delivers great speeds. All of the above make NordVPN the ultimate multi-purpose service. If you need a well-rounded VPN, you won’t find better value for your money. Still, NordVPN isn’t the best at everything, even if it comes mighty close. If speed is your top priority (and you don’t mind paying extra), consider ExpressVPN – the fastest VPN we’ve reviewed. And for an even cheaper VPN with a lot to offer, take a look at Surfshark – a new VPN provider running some amazing budget deals. Streaming – unblocks Netflix, Hulu, etc.